At the end of August, the biggest event for jam band music lovers must be Lockn' Festival 2018, which takes place from August 23 to 26 (four days) at Infinity Downs Farm in Arrington, Virginia. This annual music festival can not only grant breathtaking music, but also makes an opportunity for whole family to enjoy a relaxing trip, swimming, biking and more. There are multiple reasons to attend the fantastic music festival but some of us indeed have no chance to go to the destination due to work, study or super long distant. In this case, it's a good idea to free download Lockn' Festival 2018 videos using an online video downloader and enjoy music, performances from favorite musicians even entire shows at home. Started out in 2013, Lockn' Festival have attracted a great number of fans and featured many remarkable groups. Who is your most-awaited artist or band at this music festvial? Which day do you plan to attend? Check full schedule of Lockn' Festival 2018. To free download Lockn' Festival 2018 videos on video sharing sites or SNS (Facebook, Instagram) shot by fans, a powerful online video downloader is essential. WinX YouTube Downloader is the right program what you need. It is able to free download Lockn' Festival videos in SD, 720P/1080P HD, even 4K/8K (if there is a source) to MP4, WebM, FLV, 3GP from 300+ sites, including YouTube, Dailymotion, Vimeo, Vevo and more. In addition, it is totally clean and safe without bundled plug-in, adware, spyware or virus. Download/install WinX YouTube Downloader and free download Lockn' Festival 2018 videos step-by-step. Launch WinX YouTube Downloader and click +link-shaped icon on navigation bar to access to the smaller video analysis window. Search Lockn' Festival 2018 video on YouTube or any other supported sites. Copy and paste its URL to address bar of the pop-up window. Click Analyze button. A couple of seconds later, the video info, like title, duration, list of video versions vary from resolution, format, size, code are listed. Check one version (1920x1080 MP4) and click OK.
Click Browse button to set target folder (hard drive or portable devices). Click Download button to start free downloading Lockn' Festival 2018 video. 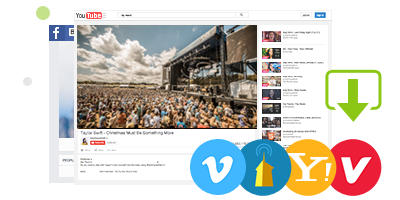 Tip: Apart from Lockn' Festival 2018 video free download, WinX YouTube Downloader also enables you to free download other music/movie festivals videos, hit songs/film soundtracks, movies, sports, news etc, in a simple and fast way. Want to play Lockn' Festival videos on latest devices featuring large screen and improved resolution? WinX HD Video Converter Deluxe, a versatile video downloader and converter, allows you to free download Lockn' Festival Festival videos (2018/2017/2016/2015/2014/2013) from YouTube, Dailymotion, Vimeo, Metacafe etc, and convert them to AVI, WMV, MPEG, MOV, iPhone, iPad, Samsung, Google, Windows Phone, Surface Pro, PS3/4, Xbox retaining high video/audio quality. Also, it is capable of directly converting HD/4K/8K movies/videos (H.265, MKV, MTS, AVCHD, MOD, TOD etc.) to MP4, AVI, MOV, Apple/Android/Windows devices at a very high speed.